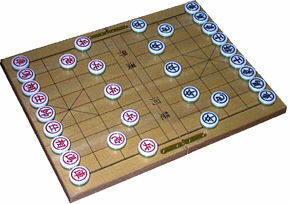 Chinese Chess, Shiang-chi (or Xiangqi), is an Oriental cousin of the more familiar European or International Chess. Phonetically, Xiangqi means Elephant Chess. Both Chinese Chess and International Chess are descended from an ancient common ancestorIndia. This ancient game traveled both east and west to become the most popular family of board games in the world today. Games of this family are played in Europe and Asia, as well as in the Middle East. They go by names like Shogi, Makrook, and Shahtranj. Like International Chess, Chinese Chess has two opposing armies with different kinds of pieces. There are some parallels between Chinese Chess and International Chess. The obvious ones are the near equivalent movements to these piecesRooks, Knights, and Bishops. Purists prefer calling this piece the General. Western players prefer calling it the King.